Today is October 3, which means that another Peartember is officially over. Although October is a great month in its own right — changing leaves, crisp weather, Halloween — we’re sorry to see our favorite month draw to a close. We know Peartember is full of giveaways, contests, and general good times, but those things aren’t really what this month is about. Peartember is about talking to educators and showing our appreciation for all that you do. It’s about getting excited for the new school year together. And it’s about connecting as a community of people who are passionate about active learning. That community wouldn’t exist without your participation, and we’re so thankful to be interacting with educators like you every day. Let’s take a look back at some of our favorite moments from Peartember 2018! 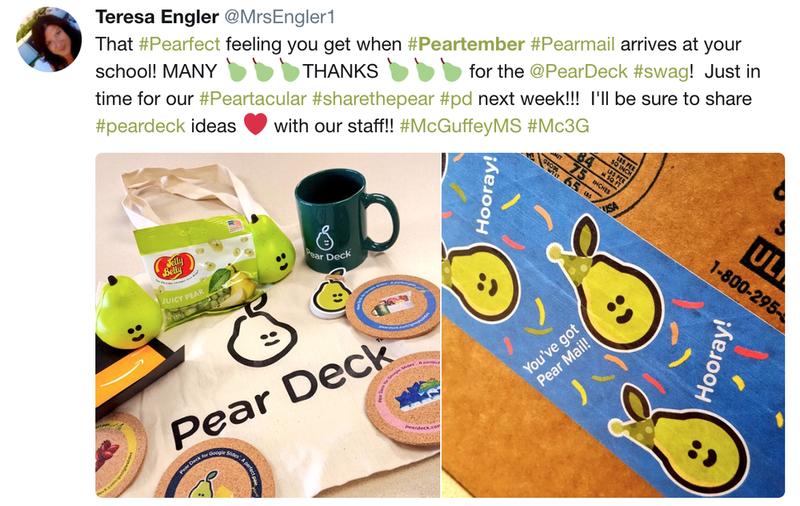 We’re always happy when teachers share their stories of Pear Deck in the classroom, but this Peartember we really felt the love. We heard from countless educators who are using Pear Deck, Flashcard Factory, and Be Internet Awesome to bring active learning into their classrooms, and we’re thrilled and humbled by what you’ve shared. 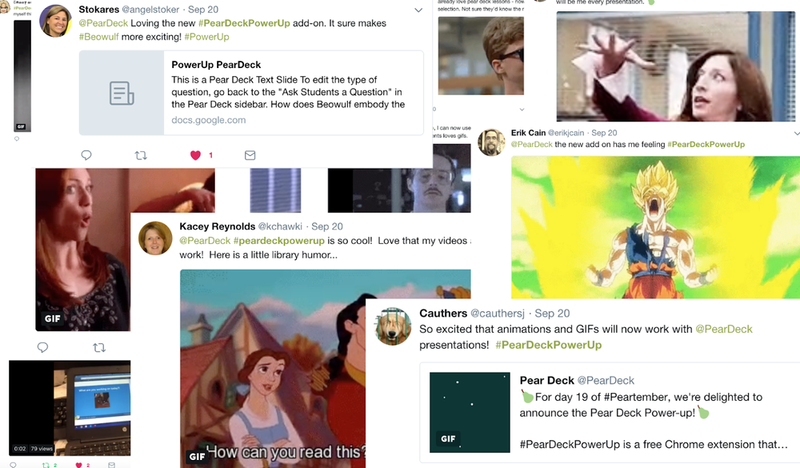 When we announced the release of the Pear Deck Power-up, we asked you to share your favorite GIFs with us on Twitter. The results kept us entertained at Pear Deck HQ for days. Teachers have been telling us about how GIFs, videos, and animations are powering up their lessons, and we’re so excited to hear it! Last week, we announced the launch of our new program to help teachers go the extra mile in their classrooms and communities: Peary Good Works. Each month, we’re giving $500 to help fund educator-led initiatives, and we’d love for you to show us your project — head over to our landing page to apply. Our first donation went to support teachers rebuilding classrooms and caring for students affected by Hurricane Florence. One of our favorite parts of the job is getting to work with great teachers: educators who give one hundred percent for their class, who work hard to keep learning and growing as they help their students do the same. This month, we sent out more than a dozen Pear Mail boxes to educators as a little token of our appreciation. We love seeing Peary in the wild! Even though Peartember has come to an end, there are still some surprises in store! Keep an eye on our Twitter feed, where we’ll be announcing the winners of our three grand prizes soon. You could still win supplies for your class, a tablet, or a sound system for your classroom! And if somehow you missed the action this year, be sure to follow us on Twitter — it’s never too early to start planning for Peartember 2019. Thanks for making Peartember a success!